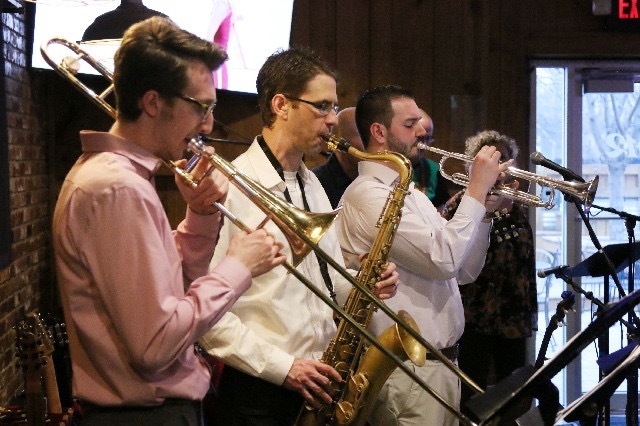 Butler music students like Alec Fenne and his colleagues practice many hours and perform multiple times a year to prepare for a future in music. Butler University’s music majors are often anonymous unless you happen to see one carting around their instrument. Rather, they’re heard from the second floor of Lily Hall, practicing at all hours with the window open to increase airflow in the stuffy, cinder block rooms. To be a music major at Butler means to commit oneself to a rigorous schedule of rehearsing and practicing, often with little compensation, in pursuit of a successful but open-ended future. Many musicians double-major, taking upwards of 18, sometimes 20 hours a semester, but spending even more time playing than what they get credit for. On top of that, juniors and seniors are preparing for graduate school auditions, recitals, juries and future careers until commencement. Students in Jordan College of the Arts play in the university’s top ensembles for a minimum of six hours per week. For that much time, they earn one credit hour. On top of that, musicians are typically expected to practice daily for around an hour, though some students work for much longer, especially when preparing for a recital. Music students are required to perform one or two recitals over the course of their college career, depending on if they are pursuing a Bachelor of Music in performance or education, or a more general Bachelor of Arts in music. A BA requires fewer music classes and is designed for those wishing to double-major. Balancing that amount of work and practice with other responsibilities is often a careful game. Haley Stevenson is a senior music BA and critical communications double-major preparing for her own viola recital. Double-majors aren’t the only ones with compounding responsibilities. Performance majors, like senior clarinetist Nolan Cardenas, face the pressures of gaining as much experience in the time that they have at Butler. His junior year, Cardenas was in three ensembles, which amounted to 18 rehearsal hours per week for three credits. In order to get additional experience, he also volunteered to play in recitals put on by graduate students or seniors. Because of their workload, music majors can struggle with self-care. Rachel Spodek, a junior vocal performance and political science double-major, found that overwork became a domino-effect problem. Physical health is often discussed with dancers or athletes, however not as much with musicians, who are still using their bodies to play consistently for hours at a time. Some musicians try to exercise or do yoga or meditate to try and give their bodies a break after hours of practicing. The physical strain combined with the psychological pressure of extremely busy schedules and high-profile performances can have serious effects as well on the emotional well-being of students, Cardenas said. Despite the rigor and strife of life in the music program, most students find it rewarding. And although post-graduation life seems scary, there are many paths available to musicians academically and professionally. Fenne, a senior music education major and trombone player, will join the working world after graduation, using the skills he learned at Butler to try and find a position as a music educator. Same goes for performers like Cardenas who are fielding graduate school offers. The audition process requires lots of preparation and travel, which can be both taxing and expensive. Cardenas drives Lyft on the weekends to raise money for auditions, which has taken him to places like Boston and Michigan. Stevenson plays in a string quartet, which will make her money over the summer. The hope for music majors is that the end result will be worth it.